There is nothing better than going on a spree to Bogyoke Aung San Market (or Scott Market), one of the most visited places in Myanmar tours located in the region of Yangon. 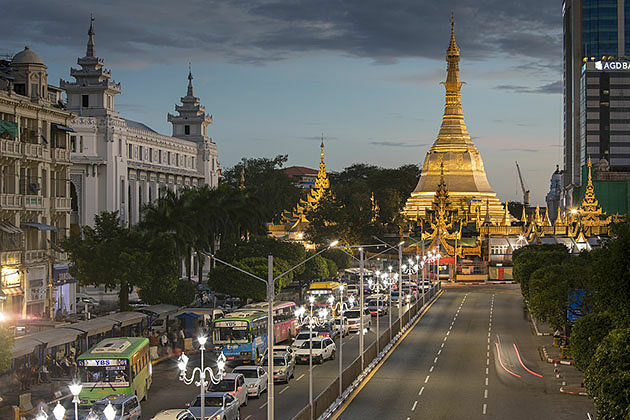 This renowned site is located in the heart of Yangon on Bogyoke Aung San Road. The name of this road was also named after the market. Get lost in the paradise of shops which offer luxury items including handicrafts, foodstuffs, clothing, jewelry, and consumer goods; and take in the magnificent beauty of the precious colonial buildings. With many things to offer, the Bogyoke Aung San Market is not only the must-see in the region but also a great tourist destination in Yangon. 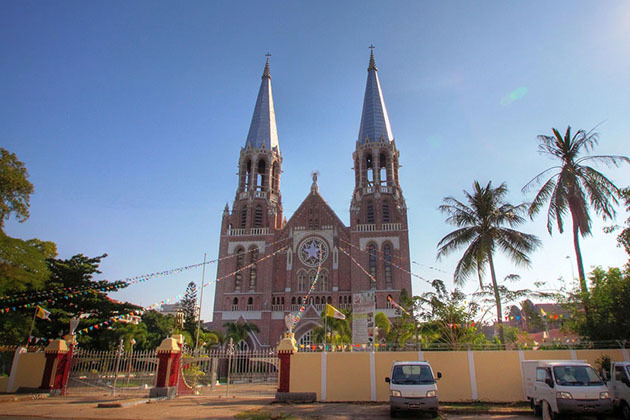 The initial construction emerged and inaugurated on the present premises in 1926. The market was renamed several times. It was named Scott Market after Mr. C. Scott, then Municipal Commissioner. Nowadays, people call it Bogyoke Aung San Market in honor of our national leader General Aung San who was assassinated in 1947. 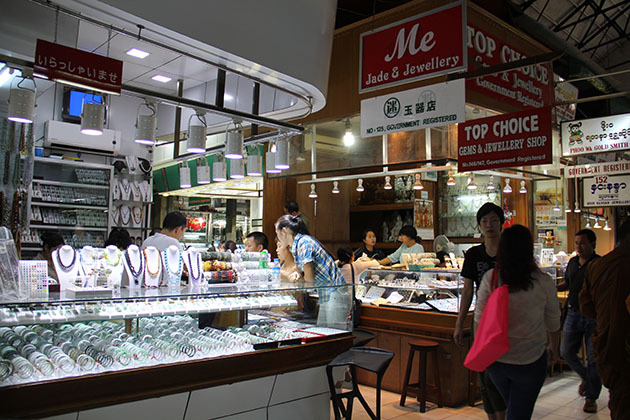 The market features 1.641 shops selling high-end stuff including handicrafts, foodstuffs, clothing, jewelry, fashion, and consumer goods. The market is a square type based and therefore divided into the East wing, West wing, North wing and South wing. The shopping items are not categorized in the respective wings. With the variety and abundance of items, meandering around and looking for your most favorite suitable item would be an entertaining activity. 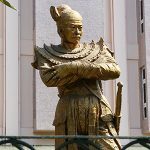 Apart from these abovementioned items, there are also traditional Myanmar and Chinese food stalls in the market. The pre-Thingyan festival also known as the Zay Thingyan meaning the Market’s water festival also gives the Bogyoke Aung San Market the nationwide reputation. This annual festival usually takes place on the 11th or 12th of April. The market attracts long lines of youngsters from all over the city coming to the market dressed for the festival. These shops donate traditional food such as Monte Lone Yay Paw, Thargu, and Shwe Yin Aye. Together with goods, Bogyoke Aung San market is also where you will be able to find traditional Burmese food and Chinese food. 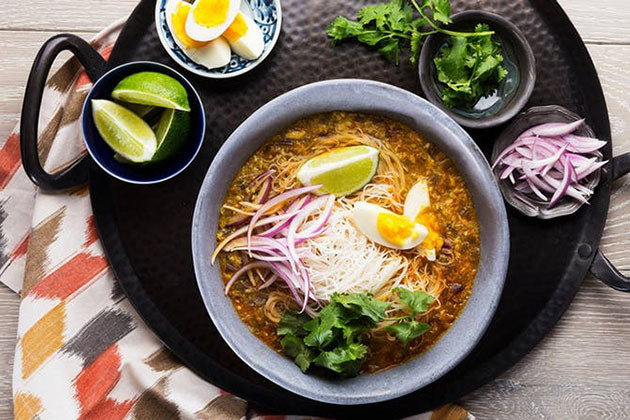 Stroll along the food area, you will capture various food stalls selling the best mohinga (a traditional Burmese rice noodle with fish and bean broth) and samosa salad. Additionally, Bogyoke Aungsan market is where you can taste the best Burmese tea, a traditional soft drink that you cannot miss a chance to try when traveling to Myanmar. Opening Hours: 9:00 am to 5:00 pm. Close on gazette holiday. 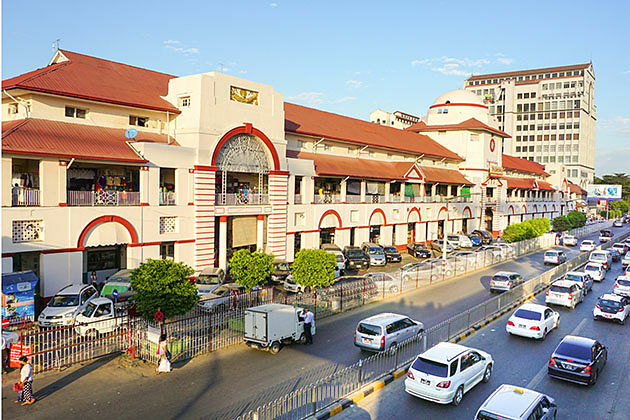 Located in front of the Bogyoke Aung San Market, the bustling Shwe Bon Thar Street (formerly known as the Mongol Street) is a must-go place in the region. This place is also the home to most of Yangon’s popular clinics. It would be amiss without mentioning another nearby attraction, the 9-storey FMI building which houses several shops and some offices. Then you can make your way to the Grand Meeyatthar Housing, which is an ideal place for you to stay downtown. The Traders Hotel is located near the market at the corner of Bogyoke Aung San Road and Sule Pagoda Road.